We Are Stardust pays homage to hospital namesake, Albert Einstein, and his Theory of Relativity. 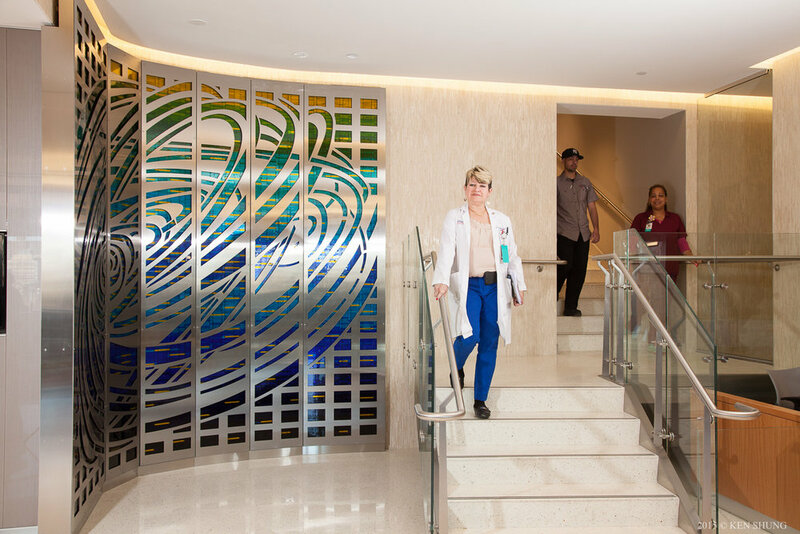 Created with a full-color spectrum of art glass and partnered with a swirling galaxy-like design in stainless steel, this artwork seeks to interpret one’s understanding of the universe. The beauty of the glass reflects the diversity of humanity. And the intricate patterned overlay suggests one’s place in the cosmos. Together, they speak to our human connectedness and the cycle of life. Our Celestial Bodies is the sister piece to We Are Stardust, located across the lobby at Weiler Hospital. Where Stardust speaks to humanity and our place in the universe, Celestial Bodies speaks to individual and unique souls that form that galaxy. The glass discs are reminiscent of portholes that look through the wall to something greater, while the patterns, both complex and captivating, encourage people to study them and their optic qualities, achieving moments of contemplation and calm in an otherwise busy and stressful setting.